The Death's Head Hawkmoth is one of the largest moth species in Europe and is a very interesting species from many points of view. 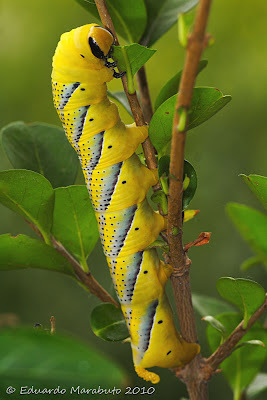 Belonging to a mostly tropical offshoot of the Sphinginae (true hawkmoths) and widespread in the Afrotropical region, it ventures into the southern Palaearctic region during the Summer where it is to be found often in abundance. 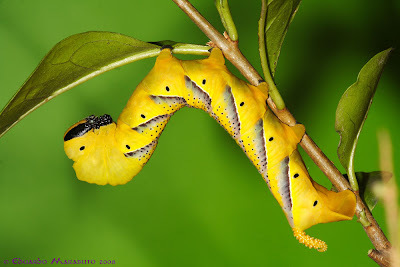 The caterpillars feed mostly on Solanaceae (potatoes and nightshades) but also Oleaceae (Olea europaea, Ligustrum spp.) and Verbenaceae (Alloysia triphylla) and are striking. In Portugal this is mostly a late summer migrant species having been found through the country but with most records from the south (Alentejo, Algarve) and the coasts. 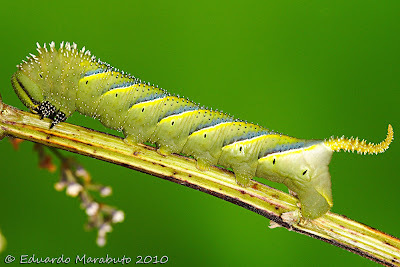 older 5th ínstar larvae can grow up to 12cm long. 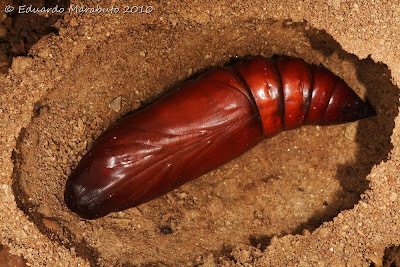 Before pupation, the caterpillar builds a well enclosed earthen chamber deep into the soil. 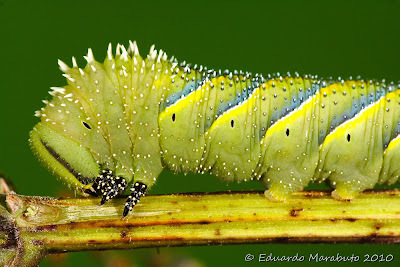 As a pupa, they can overwinter in milder places but in tropical conditions this phase only lasts for about a month. 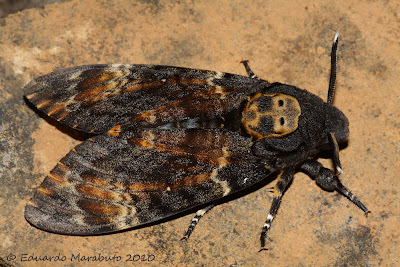 The adult is a stunning moth with a well-known pattern on the thorax, resembling a Death's Head! A lagarta é linda, mas essa caveira na borboleta, torna-a muito "sobrenatuiral", o que se terá já inventado á custa dela ? Fica só a faltar o ovo. Tambem encontrei uma lagarta em Novembro de 2010 na regiao de Tomar. A envergadura das borboletas é algo variável mas é normal nesta espécie ser entre 10 e 13cm.